The EU is largely viewed as a cornerstone of European stability and prosperity. For much of the last decade, however, many EU countries have faced considerable economic difficulties. Despite an improved economic situation in the EU since 2017, economic pressures and societal changes have contributed to the rise of populist and antiestablishment political parties, at least some of which harbor anti-EU or “euroskeptic” sentiments. Such trends have complicated the EU’s ability to deal with multiple internal and external challenges. 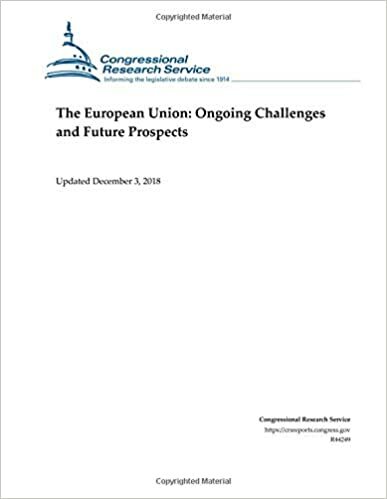 Among the most prominent challenges are the pending departure of the United Kingdom (UK) from the EU (“Brexit”); democracy and rule-of-law concerns in Poland, Hungary, and other EU members; migration and related societal integration concerns; a resurgent Russia; and a heightened terrorism threat. Amid these difficult issues, some are questioning the future shape and character of the EU are being. Supporters of the EU worry that some aspects of EU integration could be stopped or reversed. Others contend that the multiple crises could produce some beneficial reforms that ultimately would transform the EU into a more effective, cohesive entity. Recently, considerable attention has focused on developing a “multispeed EU,” in which some EU members could pursue greater integration in specified areas and others could opt out. Successive U.S. Administrations and many Members of Congress long have supported the European integration project, viewing it as crucial to European peace and security and as a way to foster strong U.S. allies and trading partners. Despite some tensions over the years, the United States and the EU share a dynamic political partnership on various foreign policy issues and an extensive trade and investment relationship. How the EU evolves in the years ahead may have strategic and economic repercussions for the United States. At the same time, some EU leaders are concerned about President Trump’s apparent skepticism of the EU and his reported assessment of the bloc as an economic competitor. Those of this view also worry that elements of the Trump Administration’s “America First” foreign policy—such as the U.S. decision to withdraw from the 2015 multilateral nuclear deal with Iran—pit the United States against the EU. A number of European officials and analysts question whether traditional U.S. support for close U.S.-EU relations may be shifting and whether the United States will remain a reliable international partner. Some observers suggest that managing relations with the United States under the Trump Administration has emerged as another, somewhat unexpected, challenge for the EU. At the same time, many in the EU hope to preserve close U.S.-EU ties and EU policymakers continue to seek to cooperate with the Trump Administration where possible on issues of common interest and concern. This report provides a brief history of the EU and the major challenges confronting the bloc. It also discusses the potential implications for the EU and for U.S.-EU relations.